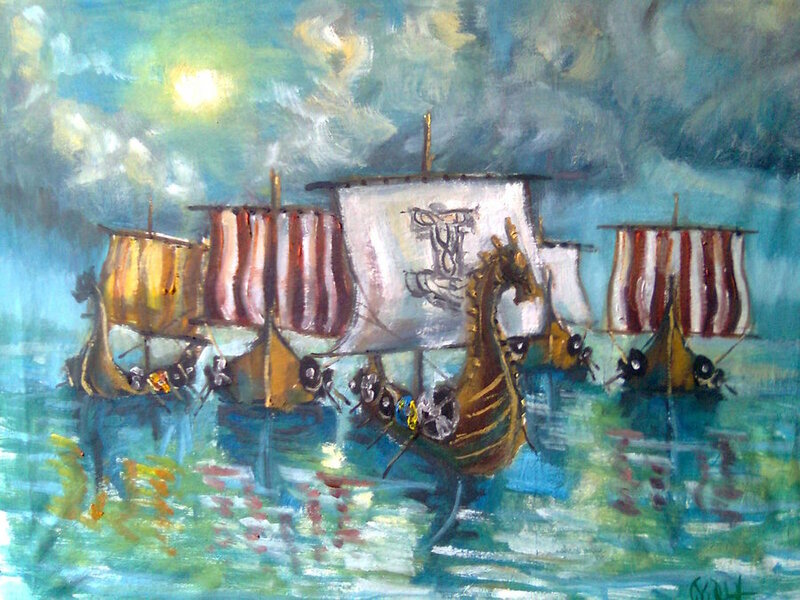 The Mediterranean offered rich hunting grounds for the Vikings. While the Arabic states of North Africa were able to repel the raiders) France and Italy suffered badly. In the east the Vikings reached the Black Sea via the Dnepr, which allowed them to raid the riches of the Byzantine Empire and Persia. No one knows the reason for the Viking raids on the coastal areas of western Europe. They certainly took advantage of political instability and division in France, Britain and Ireland but such divisions were not new and in some ways the areas were stronger and better governed than they had been fifty or a hundred years previously. Explanations based on theories of over-population in the Viking lands again raise the question of why it became crucial at this particular time. It is possible too that developments in shipbuilding meant that longer-distance raids were possible for the first time; but if such improvements did take place, we have no idea what they were, for the classic Viking ships seem to be clearly derived from those of the pre-Viking age. The explanation may rather be that a small number of adventurers set out, were lucky and returned with enough booty to persuade others to follow their example, so that the whole process gathered momentum. The first raids were small-scale and were conducted by groups of robbers and pirates without any central control. They were directed against coastal areas and up rivers by fleets of no more than ten or twelve ships and perhaps four or five hundred men. They did not attempt to occupy the land nor did they attempt to over-winter there. The best evidence for the beginning of the raids comes from England where the Anglo-Saxon Chronicle gives us the fullest information. In about 789 three ships from Norway raided Portland on the Dorset coast and killed the local reeve. This seems to have been an isolated incident until 793 when Vikings raided and sacked the great monastery of Lindisfarne on the Northumbrian coast. The pillage of this great holy place made a profound impression for until then monasteries had usually been respected during periods of warfare. These people were clearly heathen barbarians. In 795 the first Viking raids on Ireland began and in 799 western France was hit for the first time. In these early years the Vikings did not have things all their own way. There was vigorous resistance on both sides of the Channel and both Charlemagne and the English kings erected fortifications to protect the coastline. The division of the Carolingian Empire after 840, and the rivalries between the various princes, made France a much more attractive place to raid· than England, where the local rulers continued to resist effectively. The problems had begun shortly beforehand when Dorestad, the main Frankish port on the lower Rhine, was sacked no less than three times between 834 and 837. In 843 a group of Vikings seized the island of Noirmoutier on the Atlantic coast of France, driving out the monks who had previously occupied it, and setting up a permanent base for further raids. By 858 they had established another base on the island of Oissel (in the Seine just upstream from Rouen) and the king, Charles the Bald, was unable to dislodge them because of an attack by his brother Lothar from the east. The establishment of the base at Noirmoutier clearly fired the ambitions of the most adventurous Vikings. The very next year, 844, a fleet of about one hundred ships set off to the south. Their purpose seems less the fulfilment of a master plan; more, simply to discover what pickings could be had. The inhabitants of the north coast of Spain resisted fiercely, so they moved on to sack Lisbon and Cadiz before sailing up the Guadalquivir River to Seville. Here they met their match, for the Arab rulers of Spain had an efficient army and summoned help from all over their dominions. The Vikings were severely defeated and forced to flee back to the Loire. In 859 one of the most spectacular of all raids began. Hastein and Bjorn Ironsides led sixty-two ships south. They were driven off from the west coast of Spain but sailed through the Straits of Gibraltar; finding less formidable defences they raided the east coast of Spain and the Balearic islands. Over the winter of 859-60 they established themselves in the Camargue and raided France up the Rhone valley. Sailing east in the spring they destroyed the city of Luna in northern Italy (which they thought was Rome) and Pisa and Fiesole just outside Florence. In 861 they returned, again being driven off by the Spanish Muslims but sacking the Basque capital at Pamplona on the way home. Only twenty of the original ships returned. The expedition was the boldest and most far-reaching Viking foray into the Mediterranean but it was no campaign of conquest. The Vikings were raiders and booty collectors who relied on speed and surprise to achieve their ends. Faced by real resistance, they soon left to look for softer targets. During the 860s France offered a less easy prey. Charles the Bald employed a mixture of military force and the payment of Danegeld (massive amounts of silver) to keep the Vikings at bay: In the Loire area, the local counts destroyed the Viking bases and drove them out; and in 866 the Vikings, loaded with bribes, left the Seine. Navigation must have been based on long experience of watching the weather and the stars. The Vikings had no magnetic compass but latitude could be estimated from the positions of the stars and the existence of land could be deduced from the presence of birds or cloud formations, even if the land itself could not be seen. Even so, navigation on longer voyages across the open sea must have been very perilous. 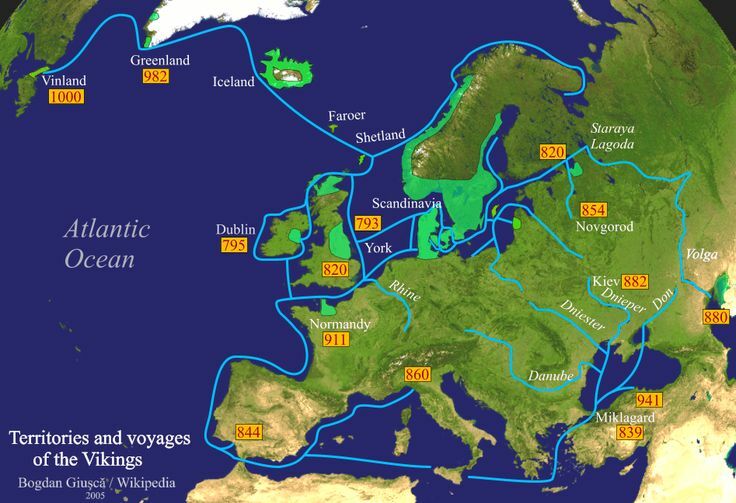 In contrast, sailing down the west coast of France and Spain, as they did in the great voyages of 843-60 and again in 966-71, must have been comparatively easy, if only from a navigational point of view. We do not have many first-hand descriptions of naval warfare, in the sense of battles between fleets. When fleets did meet, the tactics seem to have been very conservative for such brilliant seamen. The ships were roped together to make a fighting platform and the two lines of battle met head-on. As they approached each other, showers of stones and arrows would be discharged. When the fleets finally clashed, the fighting would be hand-to-hand, like a land battle in the bows of the vessels, until one side proved victorious and started to take possession of the other's ships.